What is art, except the production of something that expresses imaginative and technical skill, and something that creates beauty or an emotional impact? And what better way to express beauty than by taking something that was once useful, in a purely functional way, to create a brand new form? It’s the theory behind upcycling, the art and fashion trend that recycles the old and unwanted into the new and desirable. And this is exactly what the American artist Kat Scott does with wooden pallets. Scott, a trained illustrator with a degree from the Savannah College of Art and Design, has turned her skills and her creative eye to old wood. From an early age, she was fascinated by wood, often raiding the old pallets from her father’s recycling business in Indiana to use as her canvas. Later on, after a trip to Japan and being inspired by the Japanese wood art techniques, she saw even more potential in her father’s cast-offs. Her father supported and encouraged her ideas, impressed that she could find beauty beneath the dirt and dust accumulated from years of service. The result has been a collection of mosaic and abstract pieces which showcase the many facets of the species and grain. Of course, it wasn’t always so straightforward. As Scott began to design and imagine her finished products, she realised that her woodworking skills weren’t up to scratch. Working in wood is a skill and requires a certain degree of expertise, but through trial and error and some useful tips from her father, Scott learned to use mitre saws, planers, the table saw and a table sander. While Scott was lucky to have a good supply of wooden pallets at first, her father later sold his recycling business. This meant that she had to find a new source of old wooden pallets for sale. Luckily, finding wood pallets isn’t that difficult. 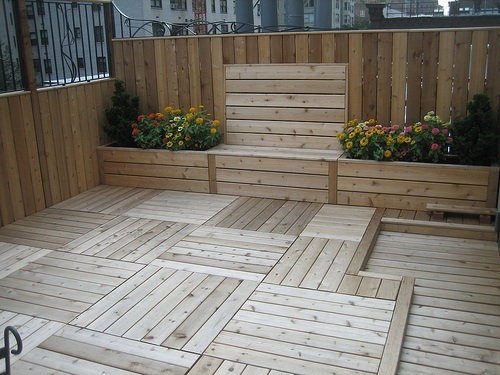 Buying good-quality used wood pallets to use in artwork is as easy as finding a pallet supplier. Companies such as Associated Pallets always have a number of pallets that they need to take out of the supply chain. These pallets are no longer suitable for carrying heavy loads but still perfect for creating works of art. Scott is now fortunate enough to have a number of galleries which stock her highly original and beautiful mosaics. Their warmth, unaffectedness and unique status appeal to a wide range of people looking for something a little different to hang on the walls of their homes and businesses. However, Scott realises that a large wooden pallet panel isn’t for everyone, and for this reason she has also started producing other items. Furniture and outdoor garden planters have proved to be very popular items, and for those looking for something smaller, candlestick holders could be her next big thing.